However, a name some might consider insensitive is actually giving directions to a fascinating and historically important neighborhood of Kochi (formerly Cochin), the capital of Kerala state in southwestern India. 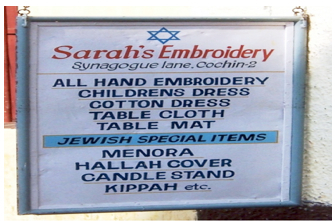 Jews have lived in Kochi for centuries, although their precise arrival date is a matter of debate. Some scholars argue that Jews first appeared following the reign of Solomon and the destruction of the first temple in Jerusalem in 586 BCE. Others assert they were Spanish merchants of the second century BCE trading for pepper and other rare spices. Some historians claim Jews settled in Cranganore, an ancient trading port near Cochin, after the sacking of the second temple by Roman legions in 70 AD. Unfortunately, none of these historical arguments can be substantiated, and the earliest firm evidence of a Jewish presence in southwestern India is a set of copper plates dating to 1000 AD that record grants of privilege to the Jewish community from the Emperor of Kerala. In 1524 Muslims attacked the Jews of Cranganore over a trade dispute. They fled to Kochi where they flourished under the protection of the Rajah of Cochin who gave them liberty to practice their religion and deeded land near his palace for homes, shops, and synagogues. 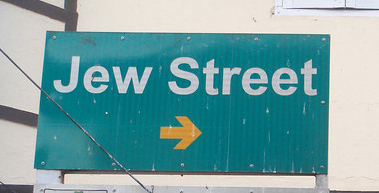 Residents called this area “Jewtown,” a name it maintains to this day. In the early 1600s the Portuguese occupied the city and persecuted the Jewish community as part of the ongoing Spanish/Portuguese Inquisition. This abuse lasted until 1660 when Kochi came under the rule of Dutch Protestants who were accepting of this Jewish presence. Again the community prospered, first under the Dutch and then, starting in 1795, the British. By the 1940s Kochi was home to thousands of Indian Jews and a vibrant ethnic community of merchants, traders, and scholars. However, with the creation of the State of Israel many in the community emigrated; those that stayed saw either their children or grandchildren leave. The population decreased rapidly and today only a few dozen Jews, most quite aged, still call Jewtown home. Although most Jews are gone, reminders of their 1,000-year presence still abound and offer insight into a religious community that few know anything about. One of the earliest houses of worship in Jewtown, the Paradesi Synagogue, was completed in 1568, and it is the last functioning synagogue in the city. 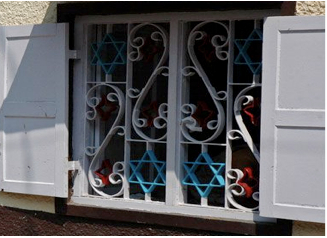 (100 years ago Kochi had seven Jewish houses of worship.) The word Paradesi means “foreigner” because at the time of its construction most members were “white Jews,” a term Indians used to identify first-generation Jews of European and Middle Eastern descent. 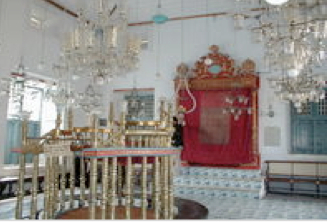 The synagogue is an exquisite building in the Sephardic style and houses historically important Torah scrolls, gold crowns, a floor of 18th century hand painted Chinese porcelain, and the original copper plates given to Joseph Rabban, the earliest known Kochi Jew, in 1000 AD. On the outer wall is a tablet inscribed in Hebrew from an even older synagogue (no longer standing) constructed in 1344. Religious services are held every Saturday morning, but as there are no longer any rabbis, services are led by elders of the community. Jewish visitors are welcome as this is often the only way to obtain a minyan, the quorum required for conducting public prayer. Afterwards guides conduct tours of the building and describe the long and fascinating history of the Kochi Jewish community. In 1968 the synagogue celebrated its 400th anniversary with a ceremony attended by Prime Minister, Indira Gandhi. Following your visit to the synagogue it is interesting as well as informative to stroll along “Jew Street” to see reminders of this ancient community etched into the architecture of virtually every store and home, even though for the last 60 years most merchants and residents have not been Jewish. An enjoyable way to complete your visit is to shop for a memento of this once proud community. A couple of Jewish residents sell religious antiques, handicrafts, and souvenirs to the few Jewish tourists who make it to these distant shores. The stores carry ceremonial objects used for the Sabbath celebration–e.g., tablecloths, wine glasses, challah covers, candle holders–as well as items used in Jewish festivals, including menorahs (candelabra) for Hanukkah, Seder plates for Passover, and groggers (noisemakers) for the raucous holiday of Purim. Jewtown is located in the Mattancherry neighborhood of Kochi, a 30-minute boat ride from the main Jetty in the central city. Half-day (3-4 hour) tours of Jewtown are available from virtually every travel agent in Kochi, and they include boat transportation, meals, and English-language guides. They often include other sights of interest in the Jewtown area, including the Rajah’s Palace, Fort Kochi, Bishop’s House, and the Chinese Fishing Nets of Kublai Khan. I will be traveling in Spain for the next three weeks and will not be posting or blogging while away. (I hate to admit this, but I will be traveling ON MY OWN DIME. Ouch!) Please feel free to read or reread any of the 84 articles posted on this blog over the past year. (Or feel free to enjoy my new book, On The Other Guy’s Dime: A Professional’s Guide to Traveling Without Paying.) When I return in mid-April I will have much more to share with you about working vacations, living overseas, and the joys of short-term cultural immersion. Until then, happy and safe travels. I want to wish everyone a Happy New Year, a year that I hope will include some adventurous and culturally rewarding travel to places far and wide. Your loyalty and continued readership have made this first year of “OtherGuysDime” a rousing success. Its 73 posts were viewed almost ten thousand times–the equivalent of thirty fully loaded Boeing 747s–and over 100 people have contributed comments, thoughts, and opinions. These numbers far exceeded my wildest expectations when I first began posting last March. In the coming days and weeks I will offer up more travel stories and helpful advice on planning your working vacations, short-term sabbaticals, and career breaks, and I invite you to continue reading, commenting, and sharing your ideas. Happy and safe travels–and please send some email when you arrive. Even though we loved our time in Kenya, since Ruth and I subscribe to the not again school of travel (see Two Schools of Traveling Thought) we really wanted to see another part of this vast continent. One of the pleasures of a working vacation is being able to pull out the atlas and decide for yourself where to go rather than having that destination be selected for you by a company, funding agency, or professional society. Our Kenyan friends and colleagues told us that if we enjoyed our three-month stay in East Africa we really should consider a trip to Zimbabwe, the country called Rhodesia until 1980 when it won its independence from Great Britain in a bloody civil war. After reading about its rich culture, natural beauty, and superb historical sites, Ruth and I decided that a working vacation in Zimbabwe would be an excellent way to relive the delights of our Kenyan safari, now many years distant, but with different places to explore and new people to meet. Not long after sending email inquiring about summer teaching opportunities at the University of Zimbabwe, the best university in the country, I received a reply from Rob Borland, chair of the computer science department, inviting me to teach at UZ during the coming winter quarter–oops I forgot about that Southern Hemisphere thing yet again! This shattering of stereotypes is another important reason to travel, especially to unfamiliar regions and places where your imaginings are far removed from the reality. For example, a working vacation in a country like Turkey (or Morocco, Tunisia, Jordan, Malaysia) will end those misconceptions about Islam and day-to-day life in a modern Muslim society–exactly what happened to my Classics professor friend as described in Official Confirmation. A long-term stay in a city like Mumbai, Delhi, or Bangalore will certainly change your perception that India has nothing to offer visitors but crowds, poverty, disease, and privation. The friendliness and warmth of the residents of Nairobi (including those in the slums of Kibera) would go a long way toward ending the misguided view of Africa as nothing but tribal hatreds and violent crime. So, on May 26th, 1992, Ruth and I set sail from the Minneapolis International Airport for a three-month teaching sojourn in the city of Harare, Zimbabwe but not before making a couple of fascinating stops along the way, in Lisbon, Portugal and Cape Town, South Africa–exactly as detailed in Getting From Point A to Point B in Style. I have no quibble with repeaters and congratulate them on discovering their one perfect Eden. Even better, the task of locating the next working vacation is far simpler for repeaters than for the not agains. After completing the first employment contract, sit down with school, agency, or institute administrators, tell them how much you enjoyed your stay, how professionally and culturally rewarding it was, and ask if they would be interested in hosting a return visit in the near future. Assuming you have not screwed up too badly and funds are available, there is a decent chance they will be eager to invite you back, and the planning for your next working vacation will have been fully accomplished. Nice and simple. I followed that path myself after a 2007 cold call resulted in a six-month visiting professorship at Columbia University in New York City, home of my now-grown children and grandchildren. I renegotiated that initial offer into a return visit for the 2008-09 academic year and beyond. 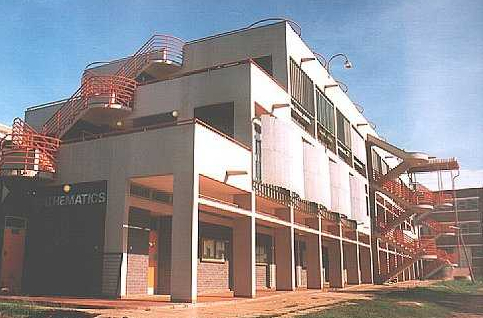 I just completed my third teaching stint at the school with plans for more in the near future. However, in 1992 my wife and I definitely belonged to the latter group, the not agains. We loved all our working vacations and found every city where we had lived—London, Jerusalem, Nairobi, Sydney, Istanbul—a destination not yet plumbed to its fullest depths. Each site still tempted with possibilities of fresh explorations and new discoveries. When we would return home, bubbling over with stories about the sights we’d seen and the people we’d met, friends and family were sure that our next trip would take us back to the same place—working vacation redux. However, in almost three decades of travel, until our return to New York City and Columbia, it never has. As much as we’ve enjoyed and savored each and every trip, when it came time to think about the next one we would stare at a world map and see too much unexplored space, too many countries not yet experienced. The U.N. has 192 member states and so far we had lived and worked in five. It seemed much too early for reruns. I would love to hear from readers which of these two schools of thought best describes your own traveling philosophy. Whether for a brief one- or two-week family vacation or a long-term working adventure do you prefer to fall back on the tried-and-true or are you more about exploring the as yet unexplored? Please share.